He has started at the age of 10 studying piano and cello, graduating later in classical guitar with full marks and honours at the Conservatorio “L. D’Annunzio” in Pescara with M° L. Guerra. As a scholarship holder he has attended a specialization course at the Accademia Musicale Chigiana in Siena, obtaining a certificate of merits. He has taken a degree of “Solisten” at the Musik Akademie der stadt in Basel in M° O.Ghiglia ’s Konzert Klass. He has won a lot of prizes in prestigious national and international competitions among which we remember: International competition “F. Sor” in Rome (1° prize), “M. Giuliani” in Bari”(2°prize), “R.Bartoli” in Salon en Provence (2°prize), the “Concorso Internazionale della Scuola Civica ” in Milan (1°prize), “G. Ansalone” in Milan (1°prize), The International Competition in Mottola (1°prize). Furthermore he has received some recognitions in The International Competitions in Gargnano, “Yamashita” in Berlin, “Le Printemps de la Guitar” in Charleroi and “Andres Segovia Competition “ in Palma de Mallorca. He has been a guest of very important concert seasons such as “The Festival Nuova Consonanza” in Rome, the “Istituzione Sinfonica Abruzzese” in L’ Aquila, Maisterkonzert in Stuttgart, “Stadt Casino” in Basel, “New York University”, etc..He has given concerts with different chamber music ensembles as the “Quartetto Chitarristico Italiano”, the Quintet “Italiamusica” and the group “Rosso Gitano” working with leading figures of the international concert panorama. Nowadays he plays permanently with Gianluca Sulli, the first clarinetist of the “Orchestra Sinfonica Abruzzese”, the Harpsichordist Chiara Massini and the violinist Aurelia Macovei with whom he made a tournée in China in 2016 performing in Shanghai, Najing and other cities. In June 2006 he performed in the “Hong Kong Academy for Performing Arts” with the Hong Kong City Chamber Orchestra showing a very interesting program “Cinema Amore Mio” presenting a series of pieces belonging to the most famous soundtracks from the Italian Cinema with great success. After that he was invited a second time in 2007 to perform in Hong Kong’ s City Hall as a soloist and arranger of F.P. Tosti’s “Romanze” with the H.K.C. Orchestra, for a musical project supported by the Istituto Tostiano in Ortona, obtaining wide consents from the audience and criticism. He has played film soundtracks composed by L.Bakalov and E. Morricone for the Twentieth Century Fox and RAI Trade. He has recorded compositions of contemporary Italian authors for the record Company Bongiovanni in Bologna, RAI Trade and Les Production d’OZ. As a composer and interpreter he recorded in 2007 the CD “Rosso Gitano” edited by Violipiano Records and in 2009 the CD “Scaramouche” edited by Wide Classique with the artistic collaboration of the clarinetist Gianluca Sulli. In June 2017 BRILLIANT CLASSICS published his last recording “Integral works for guitar and orchestra” by the Brazillian composer Radomes Gnattali (1906-1988) with the Orchestra Sinfonica Abruzzese M° Marcello Bufalini conductor. Also this work will represent a recording operation that will enrich the guitar repertoire since inside this CD you can find the “world premiere recording” of two unpublished works by the composer which have been uncovered by Mr .Salcito from the original manuscript. Soloist Marco Salcito delivers convincing performances, tasteful and technically solid….. The works are charming and approach- able. None sounds wildly virtuosic, but each has plenty of moments of excitement, along with some nice lyrical passages. Here’s hoping that this gets heard and the works are per- formed more. 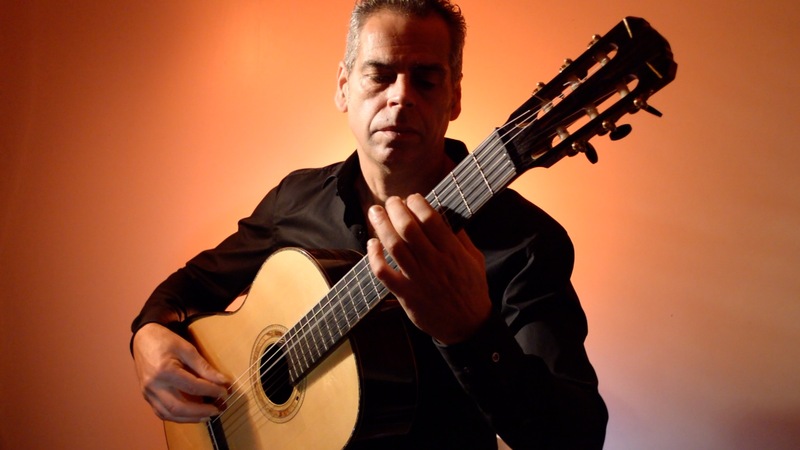 He regularly holds master classes in Italy in Venosa, during International seminars “Sulle Tracce di Gesualdo” and at Salerno University during the Italian Guitar Camp. He is chair holder of classical guitar at the Conservatorio “L. D’Annunzio” in Pescara. He plays a guitar made especially for him by the guitar maker Enzo Guido.